Classic Ironworks offer a balcony repairs service that delivers a standard of excellence that is second to none. Our services include full and partial repairs of your balcony, terrace, or verandah, implementing techniques such as shot blasting to ensure a perfect finish for your wrought iron work. We have decades of experience in wrought iron repairs, offering a solution for your repair that is cost-effective and of the very highest quality. Balcony refurbishment from Classic Ironworks can include both major and minor verandah repairs and spindle repairs, and with mobile shot blasting available from our qualified experts it is not always necessary to remove your balcony or terrace to carry out the necessary repairs. Minor repairs to your terrace or verandah can be carried out onsite, and these include cleaning, shot blasting, and spindle repair or replacement. As leading balcony specialists in Bristol and the South West, we recommend you enlist the services of Classic Ironworks for all your wrought iron restoration needs. Your balcony can often be restored to its former splendour using our advanced balcony cleaning techniques, removing years of grime and dirt from your wrought iron features to ensure a finish that simply looks like new. Our powerful shot blasting techniques can remove the buildup of rust and decay from your spindles, providing a perfect surface for finishing techniques. Once we have prepared the surface for finishing, we can then go on to paint or coat your balcony to ensure that it is weatherproof and will not suffer from further decay and rusting. Many balconies and wrought iron features are left neglected, and in the case that we find severe rust when preparing the surface for cleaning, we can replace spindles where necessary. We manufacture spindles ourselves from the highest grade of wrought iron, ensuring they match your existing features perfectly. 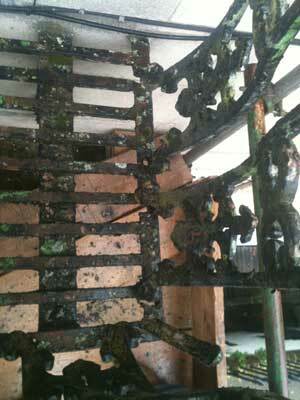 As well as carrying out balcony repairs to your property, we provide iron gate repairs, our balcony restoration techniques available for all your exterior and internal wrought iron features. We have all the necessary skills to ensure that all your wrought iron features are restored to their former glory, our team of highly qualified wrought iron experts working to offer you bespoke solutions for your wrought iron repair needs.